Cycling is not the first outdoor activity I think of when I think of Boothbay. The roads are narrow and windy and there are no designated bike lanes. Kayaking, paddle boarding and walking or snowshoeing the land trust trails are my go-to sports if I'm not inside at the YMCA or Crow Point Yoga. 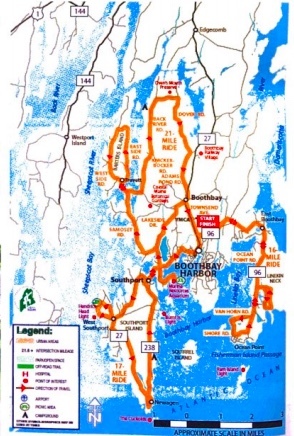 But now, the Boothbay Register's Summertime magazine has a map showing three measured cycling routes around the peninsula. But I'll be out trying them (very carefully) soon! 48 Hours in Boothbay, Damariscotta & Wiscasset » « Boothbay Harbor Fest Availability!